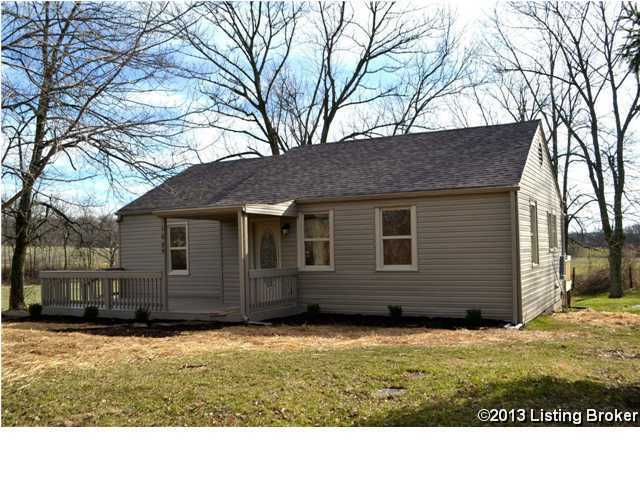 COMPLETELY REMODELED ranch style home located in the Country on 1/2 ACRE lot! With 3 bedrooms and 1 bath, this charming home features BRAND NEW ROOF, WINDOWS, NEW HVAC, and FLOORING throughout, NEW KITCHEN CABINETS and NEW KITCHEN APPLIANCES, NEW LIGHT FIXTURES, NEW DOORS and TRIM, NEW BATHROOM w/ 4-foot wide vanity, and NEW WASHER/DRYER. With a COVERED FRONT PORCH and BRAND NEW WOODEN DECK this home ideal for the home buyer looking to get out in the country without being too far away from the convenient amenities. The owner of this home is also a real estate broker in KY (Torrey Smith). Schedule your tour today! Direction: From Shelbyville: US 60 to HWY 53 North; Left onto Hinkle Lane before you get to HWY 322; Property is located on the left 1.5 miles. 1695 Hinkle Ln, Shelbyville KY 40065 is a Home, with 3 bedrooms which is recently sold, it has 960 sqft, 0 sized lot, and Driveway parking. A comparable Home, has 6 bedrooms and 5.5 baths, it was built in and is located at 3661 Taylorsville Rd Shelbyville KY 40065 and for sale by its owner at $ 1,785,000. This home is located in the city of Shelbyville , in zip code 40065, this Shelby County Home, it is in the NONE Subdivision, and Town N Country are nearby neighborhoods.